Altius highlights the best and most unique attributes of the city, those idiosyncratic moments of Pittsburgh’s topography and culture that are etched in the faces of our environment and in the memories of those who live here. The building’s identity had faltered in recent years, as its facade began to crumble, but with a more contemporary composition and the selective use of modern materials, the building reasserts itself as an upscale dining establishment. A sequence of lights activate the pedestrian space in the evening and provide a more intimate sense of scale throughout the day. The added texture builds anticipation leading to the entry. A material change signals the entrance and a slice of the facade is peeled away, allowing one to peer through double-height space behind – and to the spectacular view beyond. The new facade is only the beginning of the transformation this building has undergone, now featuring a much more open composition of spaces inside that allows for unobstructed views and a more comfortable dining experience.Through the door and past the stair, the room expands into an open space, the bar and upper dining spaces consciously framing the panoramic scene. 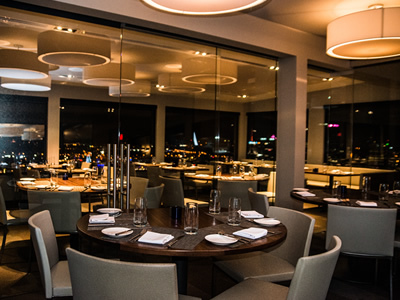 The lower dining spaces offer sweeping walls of glass: the Pittsburgh skyline envelops the room. A new stairwell welcomes patrons to a second floor, featuring additional dining space, and, by separating guests from the staff, also allows for enhanced level of service. The theme of openness and uninterrupted vistas continues between the two dining floors. Tactile materials on both levels heighten the senses, offering texture and character in a playful approach to modern luxury.